Winnipeg is a city of endless activities and distractions, but if you’re looking to take in a show while you’re in town, the Exchange District offers some of the city’s best entertainment. Our local experts have been taking in the cultural presentations in this neighbourhood for years, and have compiled their picks for the best music, film and theatre venues. Here, in no particular order, are the best entertainment spots in Winnipeg’s Exchange District. Old Market Square is right in the heart of both Winnipeg and of the Exchange District. This multi-purpose green space hosts many festivals and vendors throughout summer months, but the newest addition is a structure known as The Cube—rightfully named, as it is a 28-foot silver box created as a venue to host outdoor concerts. The structure is as beautiful as it is functional, using optimal space by offering two stages (one main stage and one rooftop stage) and walls that act as curtains that draw back to reveal the stage. Sure, it doesn’t look like much on the outside, but step inside the Burton Cummmings Theatre and you are transported through time to a lavish old-style theatre complete with gold finishings and a balcony lined with plush red theatre seats. Over 100 years old and named after the frequent lead singer for The Guess Who, the theatre hosts myriad theatre shows and large concerts. If you’re planning to visit the Exchange District, be sure to check out the upcoming events at BCT. The Centennial Concert Hall holds over 2,000 people, making it one of the larger venues on our list. This Exchange District mainstay hosts the Royal Winnipeg Ballet, the Winnipeg Symphony Orchestra, the Manitoba Opera and many high-profile international artists. It also supports different off-shoots of the arts within Winnipeg. Centennial isn’t just about performance, though. The venue has a rotating exhibit space, known as the Piano Nobile Gallery, which offers visitors the opportunity to browse through the work of local artists. See what’s on this month by clicking here. Since opening back in 1914, when tickets cost a mere 10 cents, the Pantages Playhouse has continually provided guests with quality entertainment. 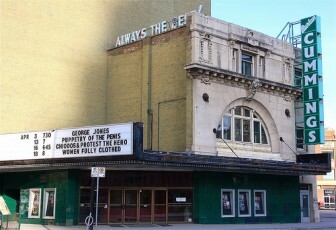 the venue hosts a number of theatrical plays and concerts, and is the home of the Gilbert and Sullivan Society of Winnipeg. Check out the upcoming events page if you wish to enjoy this historical playhouse during your next visit. The Royal Manitoba Theatre Centre is one of Winnipeg’s highest-profile live drama venues, consistently producing masterful productions (over 600 plays!) while putting forth talents who have gone often on Hollywood (Keanu Reeves, Len Cariou and Fiona Reid). Every year, the Royal Manitoba Theatre produces ten plays on two stages and partakes in two major festivals, including the Master Playwright Festival and the second-largest fringe festival in North America, the Winnipeg Fringe Theatre Festival. With shared focus on new productions and classical revivals, this hotspot is sure to have something for everyone. For a list of what’s playing now, click here. This sister stage to the Royal Manitoba Theatre Centre (see #5) is conveniently located just three blocks away. The Warehouse hosts four productions at a time in its unique state-of-the-art theatre that seats 286. Though it’s not the largest theatre on our list, the Tom Hendry brings high-quality art in a small package. A sampling of previous show includes classics like Waiting for Godot, Steel Magnolias and Kiss of the Spider Woman. Check out what’s coming up by clicking here. The Cinematheque Theatre is the only cinema worthy of a place on this list of the best entertainment venues in Winnipeg’s Exchange District. It offers visitors the unique opportunity to view films that may have otherwise been lost in the shuffle. Cinematheque offers screenings of independent, underground and documentary films, as well as festival favourites. If you’re lucky enough to attend a screening with guest speakers, you can interact and understand what goes on behind the camera. Be sure to check out Cinematheque’s events page to see what’s playing now.